S + D's Bohemian, Rock'n Roll, Gay, 29 Palms Inn Joshua Tree Wedding! Sara + Dana are my ideal couple. They are warm, kind, fun, and super stylish. 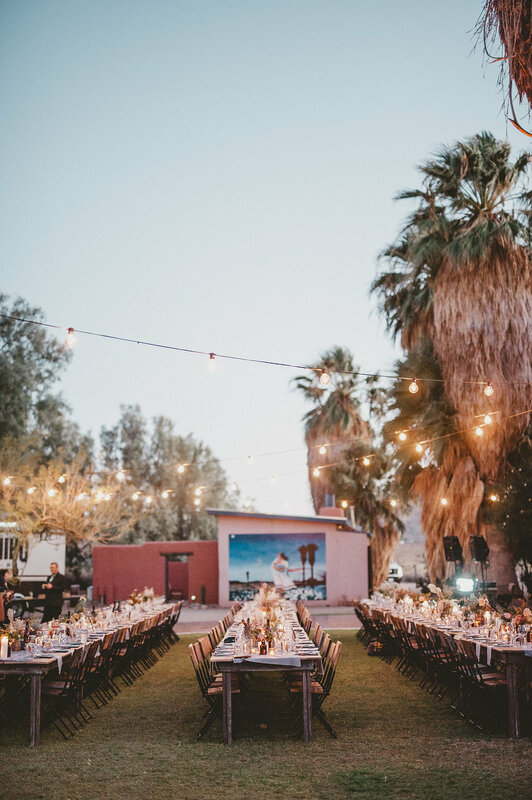 They wanted to host a Bohemian meets Rock n Roll Wedding in the high desert, and that is what we did! Their guests checked into 29 Palms Inn for a weekend celebration filled with dips in the pool, drinks, and fun. We shuttled their guests to the Indian Cove Amphitheatre in the Joshua Tree National Park (after they hit up the "bag your beer" station). Then we brought them back to the Inn to continue the party with a delicious meal under the stars. Of The Flowers created the perfect desert blooms to match their neutral desert color palette. Planks & Patina provided the tables, chairs, and lounges that you will see EPlove's magical photos below. The Old Fashioned Caravan served fresh craft cocktails and MIHO Catering served delicious burgers and chicken sandwiches from their Gastrotruck. We finished off the night with fresh hot churros paired with specialty dipping sauces. Guests danced the night away to the tunes of Sara + Dana's friend, DJ Stanley! Processional: The Cure - "Untitled"
Recessional: Led Zeppelin - "Going to California"
First dance: Depeche Mode - "World In My Eyes"